Aprilia Storm 125 was showcased at the 2018 Auto Expo and will launch soon in India. It looks a bit different that SR125 and will probably be cheaper than SR125. Aprilia Storm 125 is long due in India. It is basically another 125cc variant from Aprilia, but will get a distinctive styling, when compared to SR125. Currently, Piaggio has Aprilia and Vespa brands in India. Both the brands have 125cc and 150cc scooters in the stable. 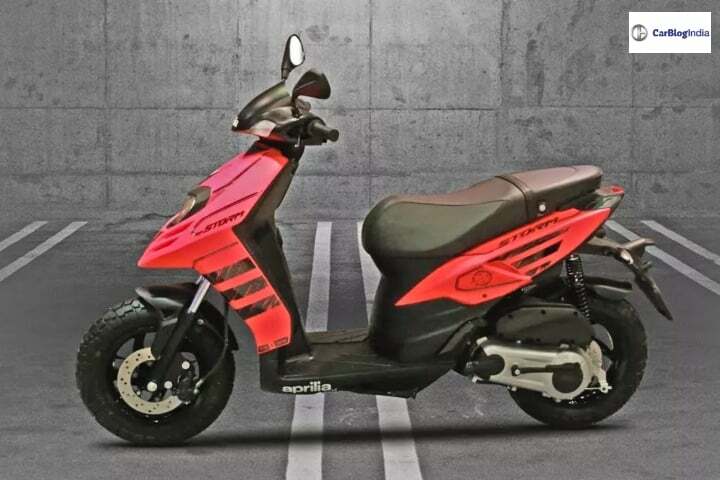 While Vespa gets the retro scooters, Aprilia offers sporty racing scooters. Aprilia Storm 125 will get a variety of cosmetic upgrades. It gets a fresh set of decals and graphics, off-road tires, a windscreen at the front and a lot of colour options. Probably, it will get matte colour options only. Aprilia Storm 125 somewhat looks more mature than SR125. Taking the off-road tires in consideration, probably, it could be positioned as a touring or an adventure scooter. On the other hand, SR150 is better performing. For December, it sold 1632 units, seeing a Y-o-Y growth of 110%. In order to boost up its sales in 125cc segment, we expect the Aprilia Storm 125 to be priced lower than SR 125. So, we expect a pricing range of Rs 62,000 to Rs 65,000 (ex-showroom). At this price, Storm 125 comes in a stiff competition with TVS Ntorq 125, Suzuki Burgman Street and Honda Grazia. Out of these three, Ntorq is the best selling scooter with monthly sales crossing 20,000 units on an average. Aprilia Storm 125 will continue with the 125cc engine that comes on SR125. The engine puts out 10.5 BHP and 9.9 Nm of peak torque. It gets the most powerful engine of the lot, making SR125 the fastest 125cc scooter. Features onboard will be similar to that in SR125. Storm 125 will come equipped with Combi-Braking System, in order to comply with the safety regulations.